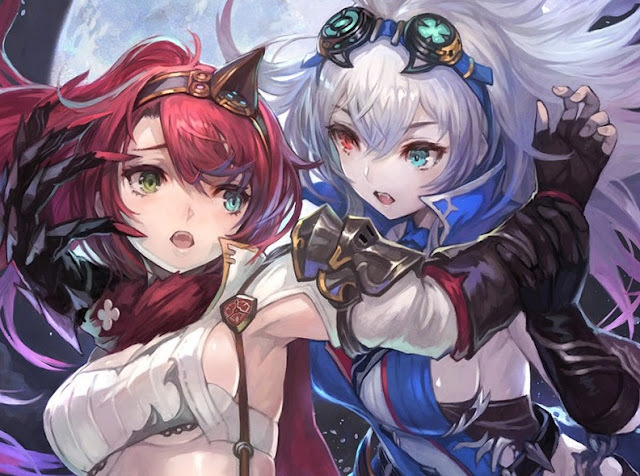 Nights of Azure 2 has made some meaningful changes to its combat system when compared to the first. Having finished the game I’m still not entirely sold on those, given that I really liked the mechanics the first time around, but they’re still clean and playable, and more importantly, they don’t get in the way of the real strength of this fledgling series; the distinctly theatrical storytelling and gothic artfulness of it all. 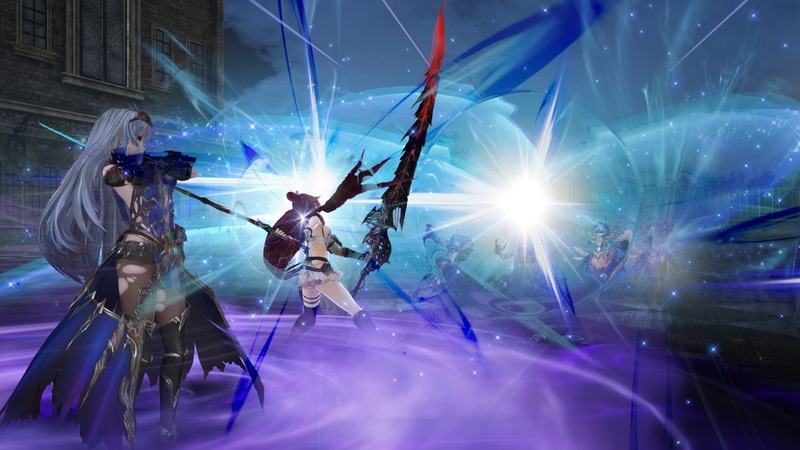 Related reading: Matt's review of the first Nights of Azure. Have a read of it, as it covers many of the themes also present in this game. The first Nights of Azure was explicitly operatic in tone and style. The story was one of sorrow and inevitability - two themes that opera just loves to explore - and from the environment design to the boss enemies through to the costuming, there was that overwhelming “high art” sense to the game which could make it both confounding and deeply, majestically beautiful. It was also a game that took those classically outdated damsel in distress and sacrificial woman tropes, and delightfully subverted them by making the hero responsible for protecting the maiden, and trying to figure out how to save her from being sacrificed at all, a woman. A strong, powerful woman, at that. You could argue that the game then proceeded to exploit both characters by depicting them in a romantic relationship and having them appear to one another almost completely naked (as a gameplay mechanic, no less), but these moments were, as pieces of narrative, potent moments of vulnerability and emotion, and worked to really drive home the emotional side of a game that was pretty heavily focused on combat. The sequel doesn’t do much to change up the narrative or thematics of Nights of Azure. The game is still set in a world that is rapidly being consumed by the night and the demons that call the darkness home, led by a mighty demon of incredible power. There’s still a young priestess - Liliana - that has been designated as a sacrifice to ward off that darkness a little longer, and she’s still protected by another woman. In this case our central hero is Aluche, the playable lead protagonist. And, yes, there is still clearly romantic feelings between these characters. Nights of Azure 2 adds in a third "main" protagonist, however, whose role is more important than just being a supplementary help. Her name is Ruenheid, a childhood friend of both girls who has ended up working with a opposition organisation to the group that Aluche and Liliana belong to. This adds an interesting dynamic to the narrative. 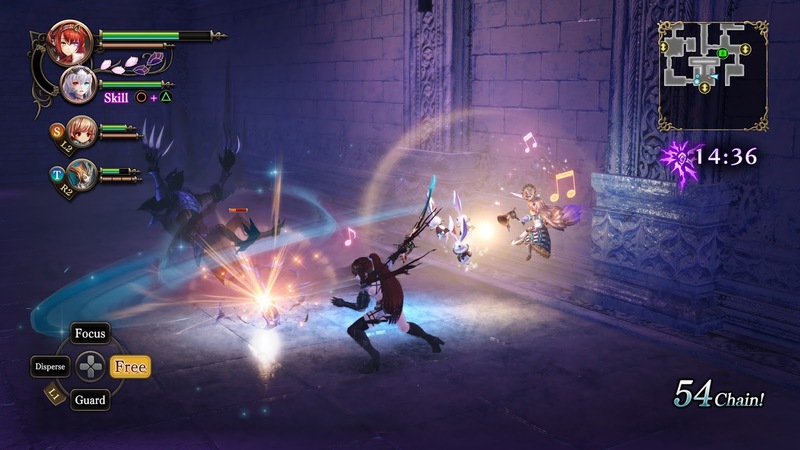 The three characters hold powerful emotions towards one another, but differences in opinion on how to go about their quest leads to some tension. Furthermore, Aluche is actually killed in the early moments of the game, and resurrected through a mystical process by bonding her to a demon, turning her into a half-demon. With demons being a group that Ruenheid is obligated to destroy without question, there’s an further layer of tension added in there. It doesn’t take long for Nights of Azure to settle itself into delivering its very sorrowful and graceful tone. The combat is fast and pacey, but also flowing and elegant in design; there’s never a great sense of impact behind sword strikes, and while some might say it's a flaw, I'm inclined to think otherwise, because it lends a more rhythmical sense to Aluche's movement and a sense of theatrical performance to her sword strikes. Meanwhile, between combat there characters are left to hide in a hotel; one of the very few non-hostile parts of the city, where they constantly express a mixture of love, desperation, and sadness for one another. This non-combat stuff is all very melodramatic (I don't mean that in the pejorative sense that the word is usually used in), and that, of course, is a hallmark of opera. The game’s narrative is quite straightforward for all that. 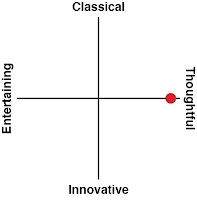 Opera tends to be quite binary in its morality; good stuff is good, bad stuff needs to be destroyed, and though there’s the potential for the half demon blood running through Aluche to complicate things by putting her in a grey area, the narrative isn’t really interested in exploring that. Rather, it’s still a story of evil and the heroes arrayed against it. What the game wants us to fixate on is the deterministic idea that each person’s fate follows a kind of pre-determined path (another very common thread to opera). We have an extreme example in this game where Aluche actually dies, and yet is brought back to fulfill her narrative role. Then there's the sacrifice that we spend much of the game working towards and the bittersweet moments that creates between the sacrifice and those that love her. 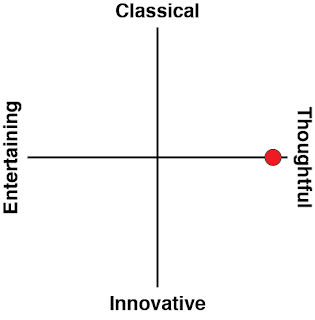 The reason opera is so in love with determinism is not because the art form wants to have a debate with the opposite of determinism (free will), but rather because it allows the storytellers to build towards a tragic conclusion that audiences know is coming… and because we know it’s coming, the emotions that are expressed through the narrative have a greater impact. Without giving away actual spoilers, as the plot does drive towards its conclusion, Nights of Azure 2 does break away from this structure a little, but it’s marginal. For the most part this game tells a very focused deterministic story. Gust, the game’s developer, has also been very clever in terms of level and art design. Nights of Azure 2 won’t be winning any technical awards, but the art team has used some masterful art direction fo come up with some visually spectacular areas to explore that really reinforce the theatrical themes behind the narrative. And, of course, there are so many beautiful girls. Ultimately all of this comes together to build a story that’s hard to put down. I actually found it a reasonably challenging game, because I’m not great with pacey action games, but it’s one of those rare games that I never even felt the need to put down. I can't make this clear enough: there are just not enough games that are pitched quite as the two Nights of Azure games are. And that's why I love them so much; for the slight flaws which I describe below, these games are different, creative, beautiful, and very artful. And that means a lot to a person like me, as someone who plays far too many games. As I mentioned at the start, the game offers some significant changes to how it plays. In the original Nights of Azure, you would build “decks of cards” which you would then use to summon monsters that you had caught through the game to the battlefield. These creatures were really everything to your eventual success in the game, because your protagonist herself was fairly weak and ineffective at combat… to the point where a lot of the time I would just focus on her avoiding combat entirely, and leaving the work up to the minions. These cards could be defeated and would then disappear off the battlefield, at which point you can summon a new one while you wait for the defeated monster to recover. In Nights of Azure 2, you don’t take cards into battle. You build a party like a standard JRPG, of which a couple of characters will be minions like the previous game (only they automatically join you and follow you around), and then a second character that also joins you is one of the women that partner up with Aluche on her quest - be that the "third protagonist" in Ruenheid, or one of the more minor characters you meet up with along the way. Each of those partners have different skills and abilities, but really the reason they’re in the game is to give Aluche a greater role in combat. Through them, Aluche is now a much more powerful fighter, as she can work with her ally to execute joint attacks on enemies that will fell all but the bosses (and those bosses will still lose a chunk of health). Even while you wait for those attacks to build up, Aluche is still meant to be a more active participant in battle, having a greater range of attacks at her disposal, and those attacks generally being more effective. Indeed, in Nights of Azure 2, the minions have a very minor role in battle. They’re at their most effective when Aluche commands them to use their special abilities, at the cost of their mana points (so they can only do it a couple of times before they need to recharge). One little fellow can breathe fire to light up a boss that has been doused with oil, but aside from that he mostly just bounces around, inflicting fractional damage at best. Some other partner critters have different impacts on the battlefield, and then a different type of monster gives Aluche combat variety by turning into different weapons and allowing her to wield them rather than her default sword. She’s all the more deadly with this range of combat options, but again, her allies have taken a very backseat role in the game. As someone who really enjoyed Nights of Azure’s combat as something of a spiritual successor to Lost Kingdoms, where you’d play as a character with a deck of summon cards and but limited combat skill of her own, I found Nights of Azure 2 perfectly playable, but ever so slightly disappointing for the changes. I get the feeling that this combat system will be far less confusing for most people, so I can hardly blame Gust for taking the approach it has, but I do prefer the combat system of the first. One thing that I know will annoy some players is the time limits imposed on them as they play. Each time Aluche leaves the hotel, she only has a limited time before she needs to be back to recover. That time limit starts at just 10 minutes, but grows from there. While there are plenty of teleporters around that, once discovered, make backtracking to and from the hotel easy, but nonetheless, it can still be stressful to make the decision to press on when time's starting to run out. Since you only have a certain number of "days" (trips outside) to complete objectives, however, you will always be tempted to push on. You do need to be a particular kind of player to find time limits enjoyable. I'm generally okay with them, though it is a system I'd request Koei Tecmo perhaps re-think on whether time limits are really necessary if there's a Nights of Azure 3. Related reading: Gust is enjoying real form at the moment, because Blue Reflection is also an incredible game. Matt C's full review. But still, Nights of Azure 2 is a really lovely game, and I don’t really play it for the combat anyway. Rooted in various theatrical styles that give it an aesthetic and tone that I find so appealing, it’s not the kind of game that could ever hope to find mainstream acceptance, but that’s not unusual for Gust JRPGs. The things that it does well: the characterisation, the melodramatic - but not in a pejorative sense - storytelling and the general artfulness of it all, are the reasons I played the last one, and this new one doesn't disappoint with any of that. A much larger roster of characters build on the gorgeous lore and setting established in the first, and solidify Nights of Azure as one of the most distinctive and original JRPG franchises going around. Keep building on this, Gust. It’s going well.